Viewing 0 current events matching “dorkbot” by Date. Viewing 116 past events matching “dorkbot” by Date. Cost: $25 Please bring: - Scissors - A bag or garment to modify – please choose something made of a non-stretch fabric. Dreaming of bike gloves that light up to keep you visible at night, or an awesome illuminated costume? Or maybe you’d like to add a bit of extra sparkle to your living room with a glowing throw pillow… Whatever project you have in mind, if you’re curious about the process of integrating electronics into fabric, this workshop is a great place to start. Shannon Henry and Cat Poole will start by touching on some of the interesting things being developed with eTextile methods and useful resources, then we’ll spend some hands on time laying out a basic LED circuit and sewing it on to fabric using conductive thread. You’ll learn how to convert standard LEDs (and other electronic components) into sew-able ones, and how to use standard textile fastenings like zippers and snaps to switch your project on and off, plus lots of tips on how to make your project easier and make sure it lasts. No prior electronics or sewing experience required. Conductive thread and electronic components will be provided. About the instructors: Shannon Henry loves to make things that blend the science & tech world with art and crafts. She has been crafting with fabric since she could handle safety scissors, and began integrating electronics into her art in 2008. Her eTextile work has been shown in San Francisco, New York, and Vancouver BC. 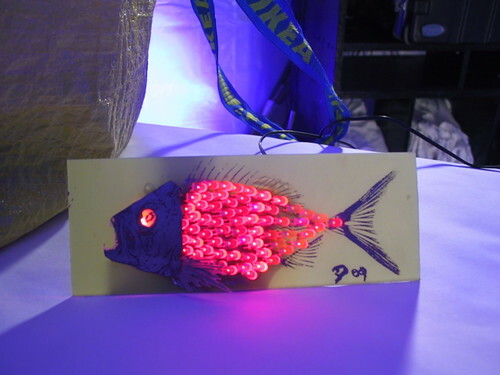 She also develops sewn electronics kits and tutorials, which you can find at her website, Polymathdesignlab.com. Cat Poole is a one woman instigator of perception bending mayhem. Through “Discovering Empowerment Through Creativity” workshops and Upcycled Electronics, she encourages all to defy their programming and void all warranties. Find out more at her site, Cacophonouscreations.com. No RSVP required. Just drop in. Description: We all love circuits with blinky lights that make strange noises, but imagine how much cooler your circuits would look on a custom-designed and manufactured circuit board. It's easier than it may seem, and we're going to show you how it's down. Using the free version of EAGLE PCB you can design your own circuit boards in a format that is then easy to have fabricated. This is an introductory course on using EAGLE to design printed circuit boards for fabrication. It's aimed at beginners that may have breadboarded some electronics, and now want to make a final circuit board. We'll design a simple circuit, draw out the schematic, and lay out a board. 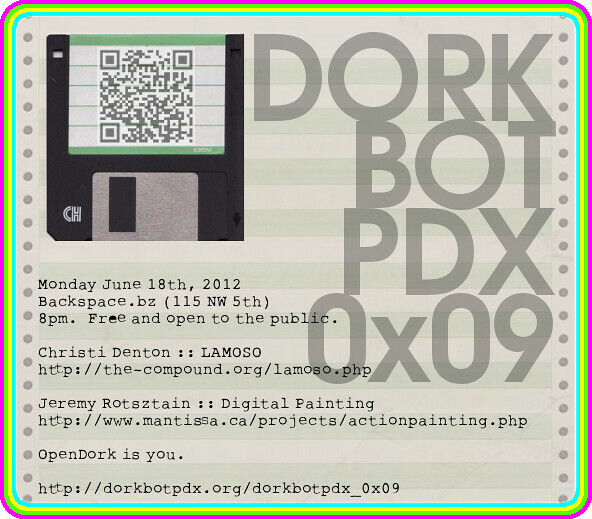 Laen, the ever dedicated Dorkbotter behind the DorkbotPDX group PCB order, will be showing you all of the necessary ins and outs so that you, too, can make your very own printed circuit boards. Nov 27, 2011 Dorkbot Workshop -- Open Lab! Where: ADX, 417 SE 11th, Portland When: Sunday, November 27 -- 1-5pm What: OPEN LAB! We haven't had one of these in a while, so on Sunday, November 27th we'll be using our monthly workshop time to offer instead open lab time. What is that, you ask? We provide the space (and some power outlets), and you bring the tools and whatever projects your working on. You can ask your fellow dorks for help and help others with their projects as well. No tools or prior experience is necessary although, if possible, you can bring a soldering iron, some type of magnifier (reading glasses, visor, etc) and a good pair of fine point tweezers. We will have some tools available to use during the workshop. Kits will be $8.00 each. Build a 2AA to 3.3V or 5V converter. Jim Larson and Scott Dixon have a lot of experience teaching this course and are looking forward to doing so again. Jared will be discussing I2C as a bus and protocol, and will demonstrate talking with a few I2C devices. Demos may include interfacing with an off-the-shelf accelerometer, magnetometer, gyroscope, and/or audio codec. Jared runs a fledgling open hardware business, ShareBrained Technology, where he experiments with devices for audio, time-keeping, aeronautics/astronautics/astronomy, motor sports, and radio. From what started as some pretty colors and cat amusement has grown to take over a walk-in closet and has had visits from all over the world. Have you always wanted to play with a robotic arm in the exotic land of Vernowhere, from the comfort of your couch? Here's your chance! Tech junkie, traveler, and avid Phish-head. Travis conformed to the corporate mold for 17 years before breaking free to travel and completely geek out. Viva La Dork! 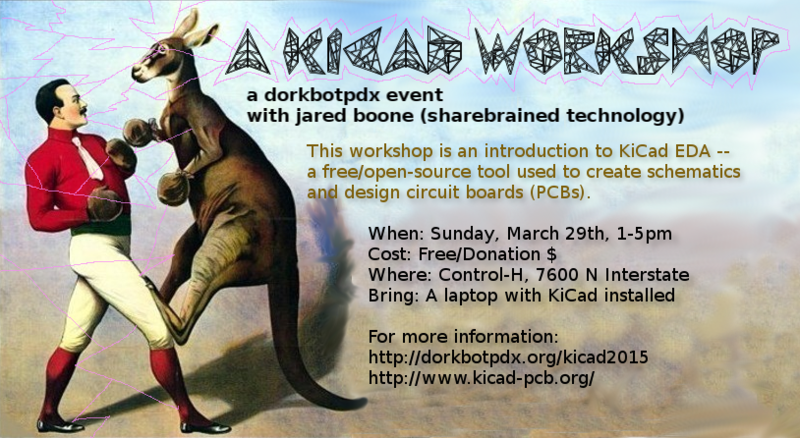 Where: ADX, 417 SE 11th, Portland When: Sunday, February 26 -- 1-5pm What: OPEN LAB! It's open lab time again! What is that, you ask? We provide the space (and some power outlets), and you bring the tools and whatever projects your working on. This is also a great opportunity to ask your fellow dorks for help with a project. Also good to bring: power strips and extension cords if you have any to spare. 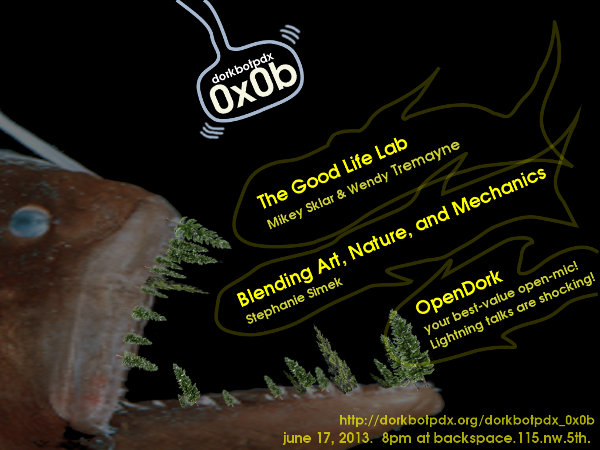 When: Monday, June 18th, 2012 - 8pm Where: Backspace (map) Who: All ages -- open to the public Cost: Free! What's happening? Two great and inspiring talks! So... the LAMOSO uses lasers and photogates to send signals to a computer, which then turns that data into sound. The lasers hit (or don't hit) photogates. The photogates connect to a Teensy++, a "microcontroller development system" (it's the computer chip thingy in the pictures), and that sends my computer data about whether there is or is not a laser beam light hitting the photogate. Max, a music programming language, is used to interpret that data into music. Visually and musically, what this means is that there's lasers crisscrossing an area, and when those lasers are broken, it changes the music. Jeremy Rotsztain writes software to generate digital images that closely resemble paintings. Instead of working with paints and pigments, he prefers to use digital materials. He collects popular images from the Internet and iconic scenes from Hollywood films -- and uses their pixels and sounds to generate entirely new compositions. 2) "Action Painting" (abstract expressionist animations made from high octane car chases, violent punches, fiery gun shots, and sublime explosions). 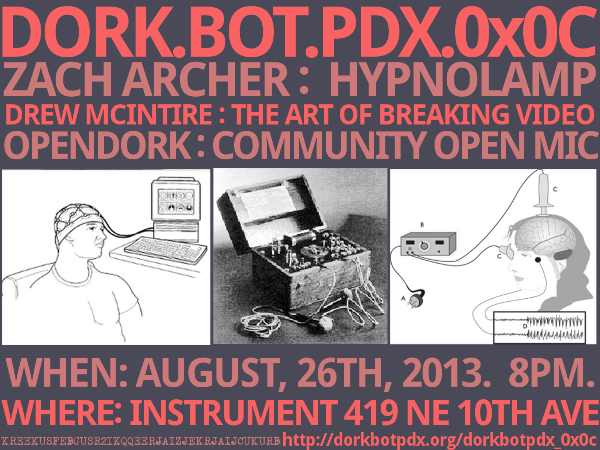 IDEA: "DorkbotPDX -- 6 years of doing strange things with electricity"
We will be taking advantage of the audio/visual system to have an open-mic style event. Think: OpenDork meets OpenMic. Bring your own signal! To sign up, add your name to the wiki page above. We're trying to keep the audio and video slots independently available, so if you're performing some sound based work, someone else could present video work at the same time. If this won't work for you (because it's a quick talk for example) sign up for both audio and video in that slot. Using LEDs and an Arduino, Zach converted a simple lamp into a hypnotic work of art. Knobs and sensors were added to control the animation and colors. Zach will reveal the HypnoLamp's secrets, and discuss the creative process, interactivity, and the coming revolution in home lighting. Zach is a developer who focuses on interactive media and installations. He lives in Portland. The Art of Breaking Video: Observations, Insights & Instabilities. Why stop at Speak n' Spells and Nintendos? Big Pauper employees an obscure arsenal of hand-modified electronics to sculpt multimedia installations, sound design & glitch visuals. Glitch video production will be the matter at hand this evening as Pauper shares the methods & the madness behind modifying video equipment, personal computers and video gaming hardware. Should be good fun!! An open-mic session for those looking to show off a project, ask a question, solicit help, or incite collaboration. Please limit to 5 minutes.